Last Fall, as I was preparing to hunt the Nebraska Sandhills for the first time, I went through my usual routine of calling the DNR (or equivalent for that state) and asking for any assistance they might feel like providing. As usual, it took three phone calls to get to the right guy, but he was perfect. 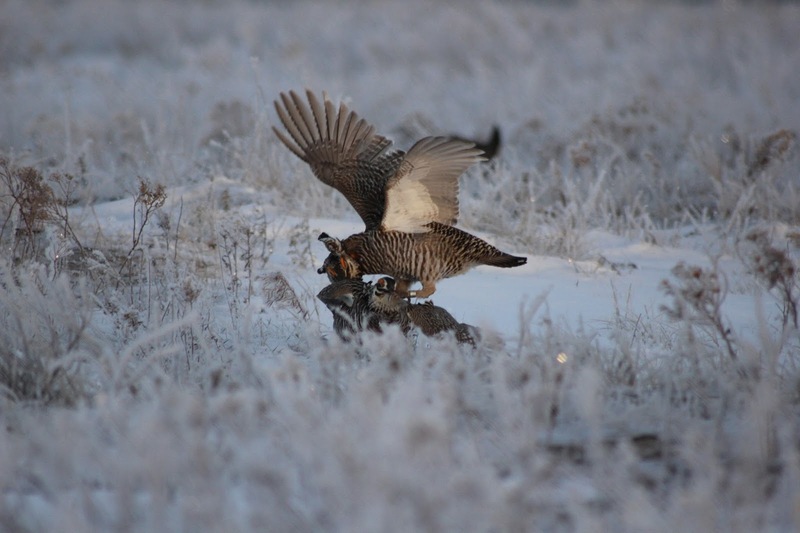 Bill is the resident expert in Prairie Chickens in Nebraska. We talked for a while on the phone, and I made it a point to stop by in person when I got to the area. As I was leaving to begin the chase, I asked about the mating rituals and leks. Bill said, "Why don't you come back in April, and I can put you up close and personal with the birds?" By the beginning of March, I was ready for a road trip. I made the call to Bill. "C'mon up." he said, "It's almost a perfect time." Two weeks later, I turned the Beast northwest and let her rip. Not on my Lek. Not today. Not ever! April weather is normally pretty settled, but snowstorm after snowstorm still plagued the Sandhills. One day was sunny and cool- the next it was snow and 20 degrees. We happened to hit the area the day after a violent front and snowstorm came through. Not to be deterred, we drove out to the blind an hour before sunrise with the thermometer reading 0 degrees. Later, we found out it set a record low temperature for the area! The blind. A snug fit. For the next two hours, the males strutted, fought, talked trash, boomed, rested, attacked, and retreated. All of them tried for the high ground. Bad Boy (above) kept them all in check. Once, they all flushed away, but in less than 5 minutes, they all returned. Like Bill said, "These birds are here for a reason. Breeding. It will take a lot to interrupt their courtship rituals." 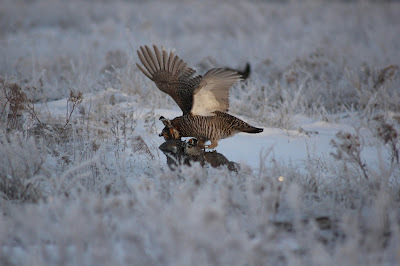 We counted nearly 20 males on this lek. Bill told us, in this area, there were 5 or 6 leks. The males stay pretty close to their leks throughout the year, even though they may fly 20 miles to grab some nice grain, they'll come back to the local area. This lek is on a private 20,000 ac. ranch in the Sandhills. 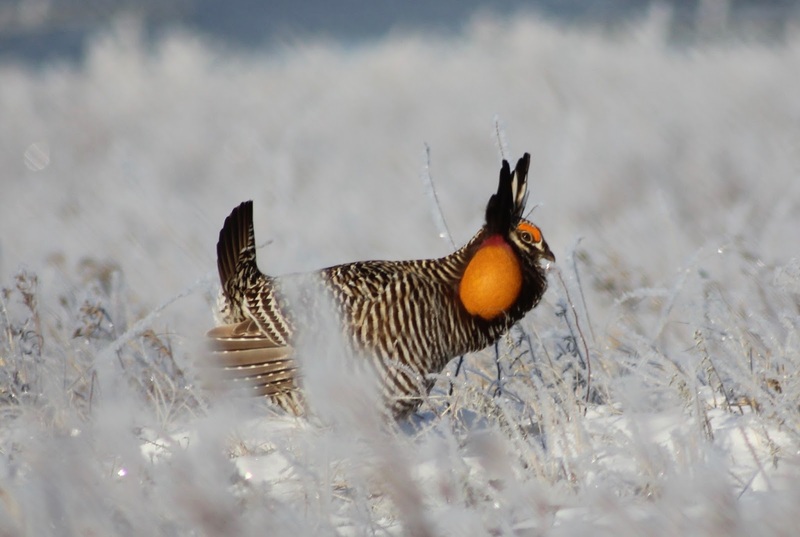 Bill works with the local landowners to increase understanding of the Greater Prairie Chicken and, perhaps, slow or stop the reduction of their range. After almost 3 hours of the coldest shivering I've experienced in 67 years, the birds, as if on cue, flushed up and away. This time for the rest of the day. We came out of the blind, and I attempted to regain feeling in my feet and hands. It took a while, but the recovery was complete. Keeping an eye out for danger or the females. All this display is for the females to pick a winner. Then, all of them will breed to one male. This display is critically important to the males for this reason. Hey! You wanna piece of me? I learned a tremendous amount about Greater Prairie Chickens in one day with this visit. When we left the blind, we drove to where I hunted them last Fall. We got out of the truck and made a loop around a stock tank, and I saw some tracks. "Gotcha, boys! I"ll see you in November!" But, between now and then, I have a puppy to train, grass to cut, and fish to catch.